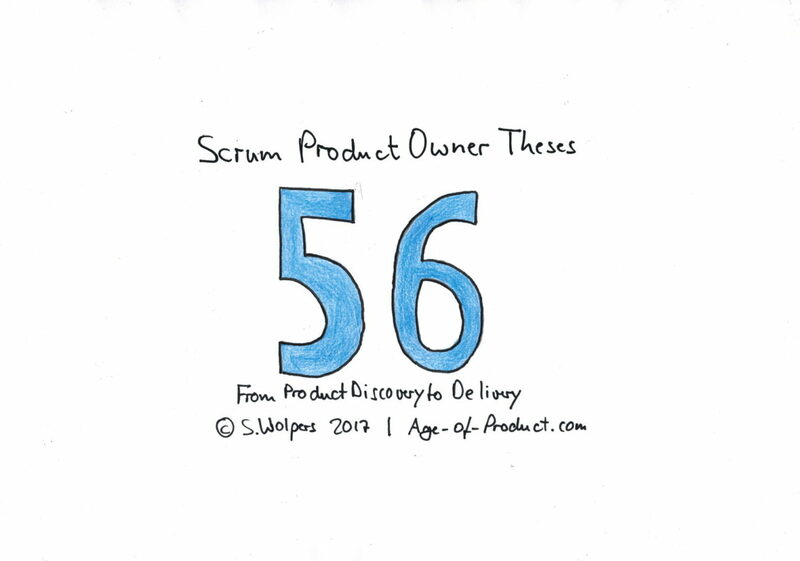 The following 56 scrum product owner theses describe the role of the product owner from a holistic product creation perspective. A product owner owns the “why,” and influences the “who” and “what,” but should never be concerned with the “how.” Progress in product development is always a collaborative, team effort. A product owner must have a holistic understanding of problems and opportunities in the market, those inherent to the product itself, with the organization and its strategy, and of concern to the various stakeholders. Frameworks and methodologies suitable for the product discovery process include A/B testing, Business Model Canvasing, Continuous User Testing, Design Sprints, Design Thinking, Lean Startup, Lean UX, and Rapid Prototyping — to name just a few. A product owner is much more than the “project manager of the product backlog,” and must do more than churning out user stories on behalf of stakeholders. (a.k.a. “ticket monkey syndrome”). It is also the Scrum role that the dark side can misuse easier than the two other roles. The “Scrum 42 Product Owner Interview Questions” PDF contain 42 questions plus answers that will help your hiring process.